A school in Louisiana got a start on developing a standards-aligned, arts-integrated curriculum by building a puppet theater. The theater built for puppet shows at the writer’s school turned out to have many other uses. I was the founding school principal of an arts-based elementary school in Louisiana. Our mission was to get kids fired up about learning by integrating the visual and performing arts throughout the curriculum. To accomplish this, we replaced paraprofessionals and other non-instructional staff with working artists: dancers, actors, painters, photographers, graphic designers, and musicians. We did residencies and workshops and held regular exhibitions and performances. We named our classrooms after teachers’ favorite artists, and we started and ended every day with A.R.T., or Art Reflection Time. I created blocks of common planning time for teachers and teaching artists to collaborate and create interdisciplinary, arts-integrated activities, lessons and projects. My goal was to create a standards-aligned, highly engaging, homespun curriculum from the ground up. It would be our crowning achievement—our masterpiece. I tried to meet their apprehension with the usual arsenal: professional development, extra planning time, and plenty of ready-made, “just add water” projects. I told them to take small steps—to adopt, adapt, and then create original arts-integrated lessons and units. 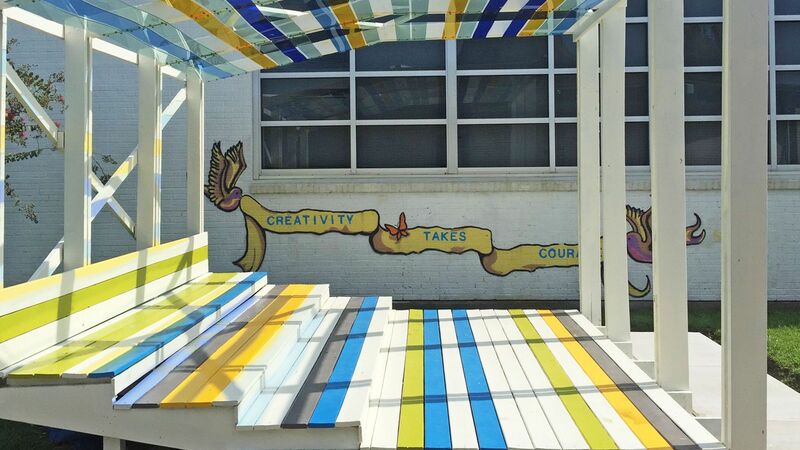 In the end, the best (and most creative) strategy came from an unlikely source—the School Beautification Committee. The committee had just finished painting signs for the school sidewalks, which were named after famous or local artists. There was Tennessee Williams Way, Professor Longhair Lane, and Picasso Place. The committee was itching for a new project. “It could be like Shakespeare’s Globe,” exclaimed one of the teaching artists. The committee solicited input from kids, parents, and teachers. A local architectural firm volunteered to do the design, and spouses of teachers and parents with construction experience lent technical expertise and tools. A school board member donated and poured the cement for the base. The School Beautification Committee organized fundraisers to cover the cost of materials. And volunteers, including our students, helped with the construction. It became a school-wide project. To set the stage, as it were, I wrote a manual for teaching with puppets. It included lesson and project ideas, connections to grade-level standards, and a list of essential questions. Sure enough, before our outdoor theater was even finished, kids and teachers started to gravitate toward it. Some of this was just sheer fun. During recess, students jumped up on the stage and performed improv. They reenacted scenes from their favorite movies and books, staged mini concerts, and performed dance numbers. But teachers took an interest as well, especially the younger ones. They had their kids write scripts, design costumes and sets, and practice their public speaking skills. And they staged plays. Pretty soon, the theater was as booked up as the library. The building blocks for arts integration can be anything. Over the years, I’ve built ponds, butterfly gardens, estimation stations, and studio and maker spaces. I’ve convinced schools to create YouTube or Vimeo channels, in-house TED Talk podiums, “cable” news programs, literary magazines, podcasts, and community outreach organizations—anything to empower teachers to be creative.